The coal industry was one of the driving forces behind the industrial revolution of the 18th and 19th centuries. Coal was used to light and heat the home, to power train and steamship travel, and all industrial machinery up to the late 19th century depended on coal. Between 1855 and 1875 British coal production in Britain more than doubled. Once mined, coal was transported to cities on barges and trains. 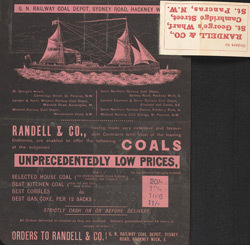 Depots had been set up next to most major train stations and the coal would be delivered from them by local companies such as this one.